By reading the Global Position System (GPS) information we have developed a handheld system that gives you information on how far (and much more!) you have been moving. You DON'T have to use the same boring tracks, feel free to RUN, Walk etc. wherever you like, the product counts the distance and time together with useful follow-up statistics. If you prefer Roller Blades, Cross Country skiing etc. the system still delivers distance information. It may be used for many types of activities. Soccer judge, Windsurfing, Roller Blades / Inlines (Outdoor), Snow board, Boat, Roller Ski etc. Our concept are built on the GPS system information together with a very sophisticated information system, all built into a handheld watch. We use the latest GPS receiver technology in our products. And the best of all, if you document your activities today, then the PC DOWNLOAD function gives you a very easy way of saving the statistics, you DON'T have to write anything, just transfer your TRIP information to the PC system and analyze it in more details. How far did you run ? What's your average speed ? What's the Altitude difference ? How many calories did you burn ? 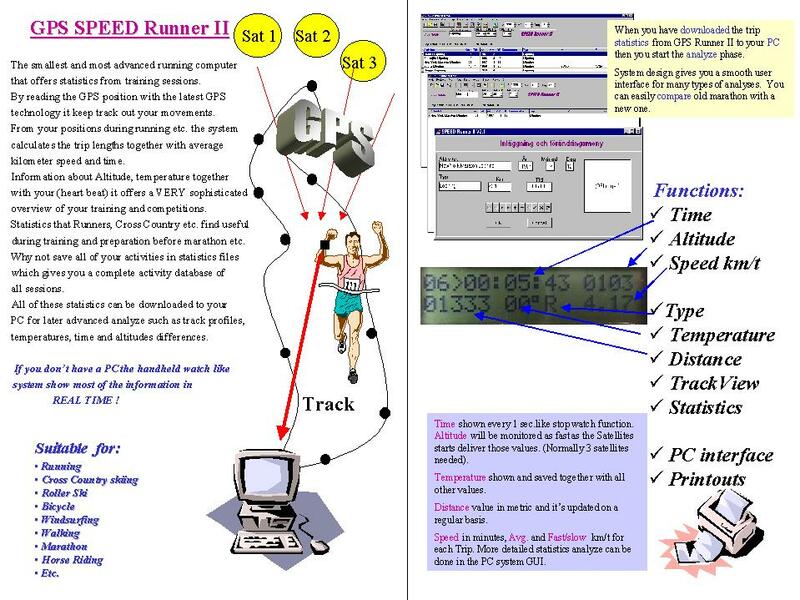 The system also makes it possible to use Internet coaching by sending stored information to the coach which can analyse your activities, speed etc.